Valley of Fire brings the drama. Valley of Fire State Park is one of the places Southern Nevadans are most proud of - it's as spectacular during the day as the Strip is at night. Whether you've been there or not, you've likely seen it dozens of times. Its vivid red formations have proven irresistible for photographers and movie directors alike; a scene-stealing backdrop for countless films and TV commercials. Valley of Fire's spectacular red rocks have even doubled for Mars in numerous sci-fi flicks. The movies first came to Valley of Fire in 1966, when Burt Lancaster and Lee Marvin rolled in to shoot The Professionals. In the mid-'90s, it was here that Star Trek's Captain Kirk fell to his death, with Lake Mead clearly visible in the background. More recently, Michael Bay's Transformers filmed a scene where the autobots are driving along the valley with other military vehicles during sunset. And even the video game "Need for Speed: The Run," features a pivotal scene shot here. Valley of Fire State Park is the oldest state park in Nevada and was designated a National Natural Landmark in 1968. It derives its name from red sandstone formations, formed from great, shifting sand dunes during the age of dinosaurs, 150 million years ago. These bright, red features were often said to appear almost "on fire," especially at sunrise or sunset. 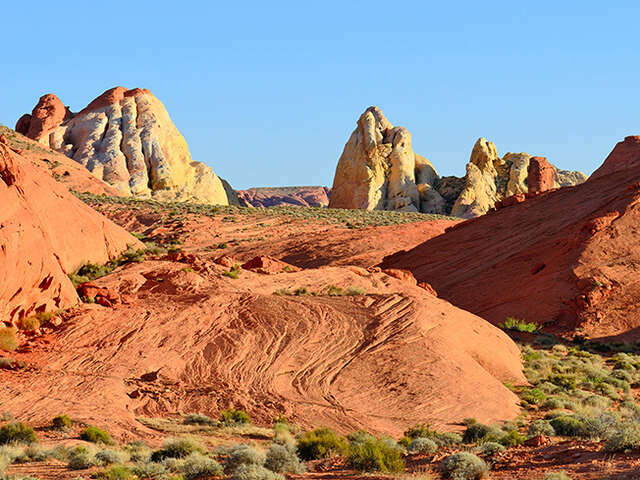 As far as tours, Valley of Fire adventures run the gamut: You can hike, ride the bus or even see much of its beauty from your car. So whether you're driving or hiking, Valley of Fire knows how to bring the drama. Contact one of our travel experts to find out how you can take part in one of the many tours on offer.